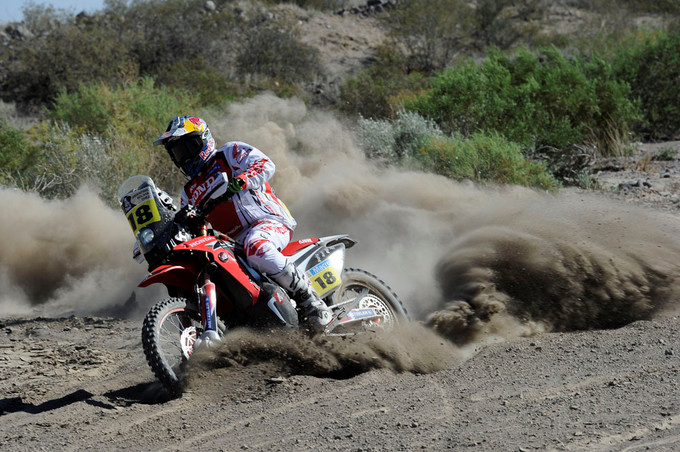 Britain’s Sam Sunderland has won the second stage of the 2014 Dakar with a brilliant performance onboard his factory Honda CRF450 Rally. The 24 year old started the day in ninth place after the opening stage on Sunday but excelled throughout the 359km timed Special Stage which saw a mixture of hard pack mountains tracks, rocks and ended with a final 60km of big sand dunes. Sunderland’s win was the first time a British rider has won a stage of the Dakar since the late John Deacon way back in 1999 when he won stage 15 of the then African race. Sunderland’s win means that he has now moved up to third in the overall standings with two of the 13 stages complete. Second position went to local hero and factory KTM rider Francisco Lopez who concluded the day just 39s seconds behind Sunderland. His result escalates him up to second in the overall standings. Factory Honda rider Joan Barreda continued his strong form by taking third place to back up his stage one win yesterday. The 30 year old Spaniard continues to lead the overall standings by 2m 03s. Dakar legends Marc Coma and Cyril Despres failed to grab the headlines on day two with the two men finishing the day in ninth and tenth respectively. Despres suffered a big crash where he hit his head and burst his camel back meaning that he had no water to drink on the final 100km of the stage. And for Coma his problem was a technical one when he got a stone wedged between his gear lever and casings, which cost him valuable minutes. However despite being over eight minutes off the lead it’s unlikely either man will be too concerned knowing full well that there is a long way to go until they arrive at the finish. At time of writing (22.23 UK time) Brits Paul Jay and Jamie Smith were yet to finish the timed Special Stage.